I found this website via Pinterest that talked about giving people a Magic Wand. People just decide the things they want done and the wand makes it happen. **If I was still in the education system I think this would be a cool writing prompt at the beginning and end of a geography or government class. *I would want everyone to have a job that they loved and were good at – whether that be a doctor, a teacher, a cab driver, or whatever. If everyone has a job then they have income and could provide at least basic needs for them and their families. *Since I believe the population is already over populated I would want my magic wand to “create” zero population growth. Not that families couldn’t have children, but that the many, many, many kids that are abandoned and in foster care could finally get adopted and feel love and the warmth of a family. *I would also want everyone to be at least a vegetarian if not a vegan. The world now chops down more rainforest for grazing than agriculture. Meaning we are cutting down forests to make cows fat for our own consumption. That’s just one negative consequence of consuming meat – do a quick Google search for impacts of consuming meat and you’ll see dozens of consequences: animal abuse, excess water usage, starving children around the globe, increased chemicals and hormones in your body, large amounts of animal waste, runoff and land degradation to name a few others. Here’s NPR’s story on eating meat, you can skip the first 1 minute and 40 seconds and stop about 6 minutes and 38 seconds, which talks about other NPR stories. *I would also re-do local, national, and international infrastructure to be more sustainable with more mass commuting types of transportation. I firmly believe if we had bullet trains running all over the nation that would cut on a lot of carbon emissions from the millions of vehicles on the road and that people would prefer to take a bullet train that lasts three to five hours to get from LA to New York instead of driving or flying, which are both tedious and expensive. If there were more light-rails, and subways, and Personal Rapid Transit, I think people would appreciate the convenience and the time savings from not sitting in two hours of traffic everyday. *I would want companies to think about cradle-to-grave manufacturing and produce goods and products that could always be recycled and reused. This would also lead to less “stuff” being taken out of the ground, chopped down, or used once and thrown away. *I would do away with all the bureaucratic BS that surrounds the school system (at least in the United States). I would want teachers to teach life skills while also teaching content but in a way that’s FUN and meaningful. I’m taking graduate classes and I can’t even stand when the professor lectures for 3 hours, why do we expect that of high school students?! There were so many ideas I wanted to do as a teacher but they didn’t follow the standards 100% or didn’t set the students up to be successful on the state standardized testing. *Which leads me to my next action: do away with standardized testing, at least the way it currently stands in the United States – it’s demeaning and doesn’t show what students can actually do or what students actually think; it only separates the students who know how to take a test vs. the students who don’t know how to take a test. I saw this kid speak in Loveland this summer and was so impressed by him! His talk is called, “Would Einstein get into Harvard?” And it talks about how the ACT and SAT are ruining high school students, and I couldn’t agree more. I’m so against standardized testing that I took it until I graduated middle school and haven’t taken a state or national standardized test yet! I went to schools that didn’t require ACT or SAT for admittance or at least didn’t require it of me after I had a degree, and I went to a graduate school that doesn’t require a GRE to get in either. *I would also ask the Magic Wand to implement a flat tax everywhere! People complain about lack of fairness when it comes to the government and taxes, but what’s more fair than everyone paying the same amount?! How is it anymore fair to over-tax Bill Gates than an immigrant who moves to the United States, becomes an entrepreneur and creates wealth for them and their family?! It’s not! If everyone pays the same across the board – that’s fair! *I would want everyone to take a class or seminar or something that taught people how to properly communicate with one another, like how to fight fair, and how to disagree with someone’s point of view without degrading the person, and basic conversation skills. I meet so many people at my restaurant that have no idea how to talk to another human being. *I would also want the death penalty for those who did heinous crimes, specifically anything to do with children or animals. The fact that if we did away with the prison system we could send every student in America (including illegal immigrants) to school from kindergarten all the way through 4 years of college is disgusting! (This statistic comes from Waiting for Superman). That money could be better spent on education children and creating a better and bright world, not keeping scumbags alive. As you can see, I didn’t ask for world peace or for everyone to get along because that’s not practical to me because there will always be conflicts and problems. I know in looking at my list, there is a few items that are pretty controversial and I feel like that’s acceptable. Not everyone would want the same things I want if they too had a Magic Wand. I could probably keep adding and adding to my list, but I feel like this is a good start at solving majority of the world’s current problems! What would you do with your Magic Wand? Since I’ve been back in the States I can’t stop thinking about opening up a yoga studio on Coco Beach in Costa Rica. This goes right in line with the Pura Vida concept I’ve been working on. Granted there are some technicalities that need to be worked out, but the thought alone calms me. Doing yoga on the beach, at 6am with the sun rising and the sounds of nature in the background; well could anything be more relaxing?! I don’t think so. I feel like tourists and locals alike would be on board with this business, because who couldn’t use a little more relaxation in their life? I feel like most people, myself included, get so bogged down in the hustle and bustle of life that we all forget to stop and smell the roses or listen to bird. In reflecting on my life, the most at ease I’ve ever been was when I was able to disconnect and spend some time in nature. Sounds cheesy but until you’ve done this it’s hard to understand. Granted I’m not certified in yoga, nor do I have any business background, but it’s still a dream that can be attained. Many people have opened businesses with no experience and only passion, sometimes that’s more than enough. There’s a local yoga studio that does a 10 week, 200 hour certification program that costs as much as one graduate class. The cost might seem pretty pricey, but at the end of the program I would be a certified yoga instructor and could run my own classes at the studio that taught me. I like this practical application of knowledge and skills. Even if I never make it back to Coco Beach, I still see many benefits of having my yoga certification. Especially since I’ve been going to yoga classes for a few years, I already have some basic knowledge. Yoga has many benefits including increased flexibility, strength, and balance, as well as improved posture, better sleep, and an overall sense of calmness and relaxation. This calmness is what I remember most about my yoga experiences and would be something I would like to pass on to tourists and locals in Coco Beach. Coming back from Costa Rica was probably one of the most difficult things I’ve had to do. Poor me, I know! But living on the beach has a certain cache than going back to the hustle and bustle of “real life.” Going back to the mundane schedule where each day passes slowly but the year passes quickly feels like I’m not fulfilling each and every day. Or at least I thought I was fulfilling my days before my trip; I don’t really feel like that anymore. It’s amazing how one experience can change a perspective that much! Pura Vida was a phrase that I frequently heard in Costa Rica. I’m going to attempt to explain what Pura Vida is, but the truth of the matter is, people will need to visit Costa Rica before they will truly understand Pura Vida. P.s. the America way to say this phrase is as is – with an R – the Spanish way to say this is where you roll the R so much it turns into a D – so phonetically it’s Puda Vida. Pura Vida is a phrase, a greeting, a feeling, and a way of life. I guess the literal translation is Good Life, but I also took it to mean ‘chill out,’ ‘calm down,’ and ‘don’t worry or stress.’ Pura Vida was how people said ‘hello’ and ‘goodbye’ to one another, similar to ‘aloha’ for Hawaiians. People also lived with this stress-less outlook on their lives – people didn’t really seem to get bogged down with the little annoyances that happen in a day. It was a wonderful sensation to live by this concept because I literally took life in a more positive stride my whole trip there. This is something I want to continue now that I’m back in the States and I’m slowly trying to figure this out. 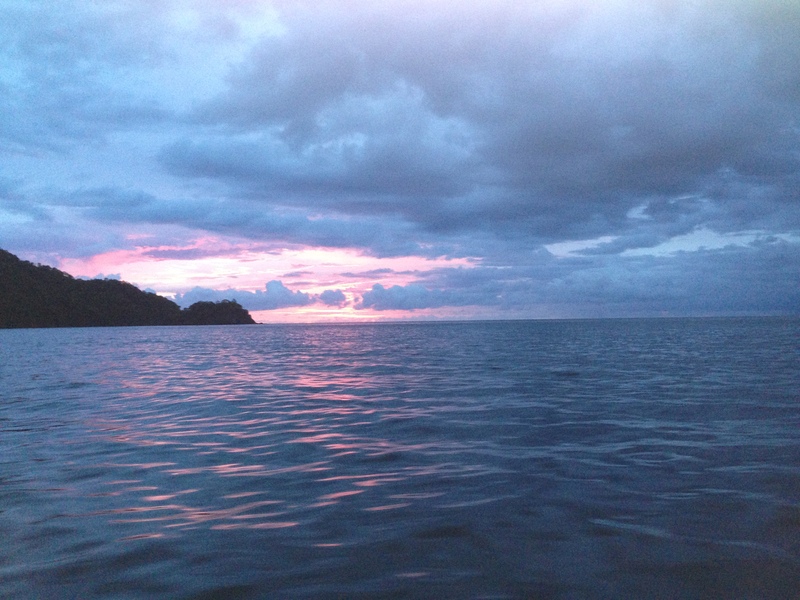 Pura Vida is also easier to live by when you’re living on the beach or in the rainforest, and not in a city. In San Jose, Costa Rica’s capital city, people still said Pura Vida to one another but it did not appear that people lived in the same Pura Vida style as those people on the beach. I’m sure it’s very easy to see why – in the city there’s deadlines, traffic, and stress, or at least that’s how I feel about major cities. Until I can get back to Costa Rica I’m going to try to find my own Pura Vida. I’m going to attempt to blend my life with Pura Vida. We’ll see how this goes but the ultimate goal is still to achieve my aspirations while being less stressed and enjoying the process more. It is amazing how one day you’re in DC and the next day it is a year and half later and I’ve been accepted to the University of Denver and starting my Master’s Degree. I feel like the day to day passes in the blink of an eye, and without a second look back so does the entire year. I think I finally, truly understand the concept of creating goals and laying out a game plan to help accomplish those goals, because without doing so, it is so easy to get behind and thus never accomplish your goals in a timely manner. As an adolescent, goals were those annoying things you had to write out in seminar class, now it’s something I do on a daily basis, to make sure I get papers done in time. So here’s to another school, another program, another year and hopefully a successful goal-planning adventure called my master’s program and my eventual career.